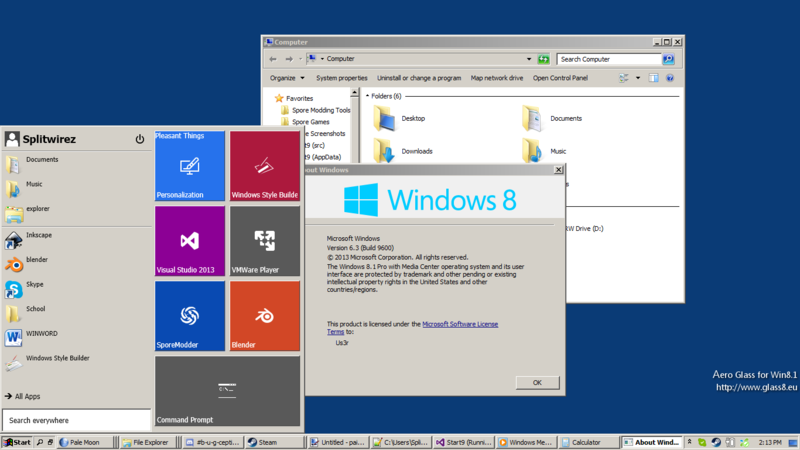 Classic Shell • View topic - Start9: A modular, extensible Shell supplement for Windows. On another note to prevent CC order call it "StartEnvi"
Categories are present, albeit lacking headers and drag-rearrangement capabilities, and fullscreen mode is in the works. Expect a Windows 8.1-style Start Screen in the future, too. I probably would've changed the name by now if I weren't so painfully attached to the name Start9. NICE Thanks for adding feature request! Also I figured something that didn't sound generic. Anyone say a word with a number in front but your project deserves to stand out from all the generic start menu clones because your startmenu will actually do more than even some of the paid competitors like StartIsBack and Start10 which almost offer the most generic features - I believe you could honestly have the best startmenu projects I have seen yet.
" 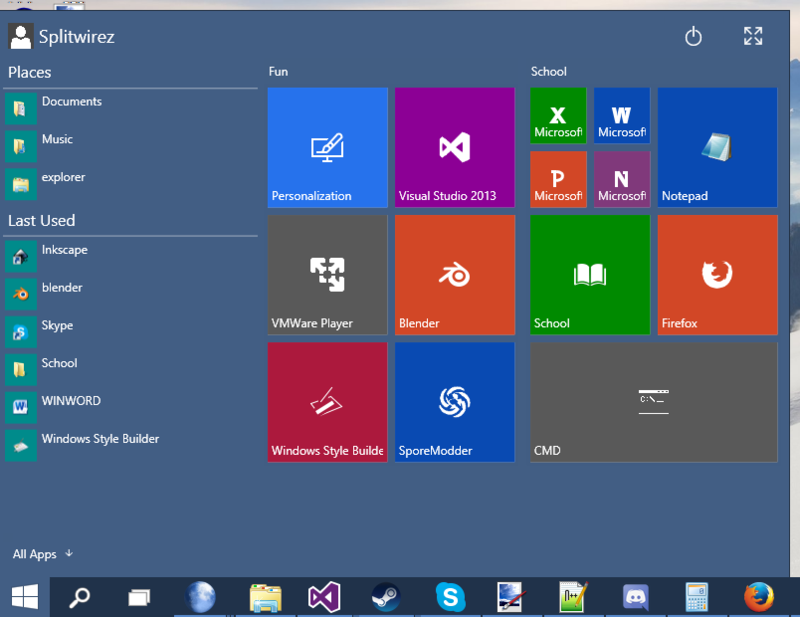 I believe you could honestly have the best startmenu projects I have seen yet." NICE Thanks for adding feature request! Assuming you mean the headers...those were already on my to-do list, I just figured this would be a good time to get them in. That having been said, I am open to suggestions, within reason. Also I figured something that didn't sound generic. ...huh. Well if anyone can come up with a name that rolls off the tongue as smoothly as Start9, I'm all ears. Provided I can convince myself to actually do anything, that is. I believe you could honestly have the best startmenu projects I have seen yet. Yeah, of course Classic Shell is Ivo's...sorry if that got mixed up, I thought that compliment was directed towards Start9 .-. Wait...which menu application was it directed at? .-. ...yeah I completely missed that ._. Error I was complimenting classic shell and start9 I figure they are both doing things slightly differently. Wait, what? Live tiles? I thought there was no api for that. I think that was one of the reasons that tiles were not added to classic shell. Although there are other ways to implement tiles. I thought there was no api for that. Certainly none Documented. I don't know the whereabouts of any related undocumented APIs, either. I think that was one of the reasons that tiles were not added to classic shell. Although there are other ways to implement tiles. True, as is the case with Start9...all I did was look at Microsoft's documentation for creating tiles for WinRT Apps and cross-reference that with the files I ripped from some of the stock Windows 8 Apps. Surprisingly, it's mostly just XML. 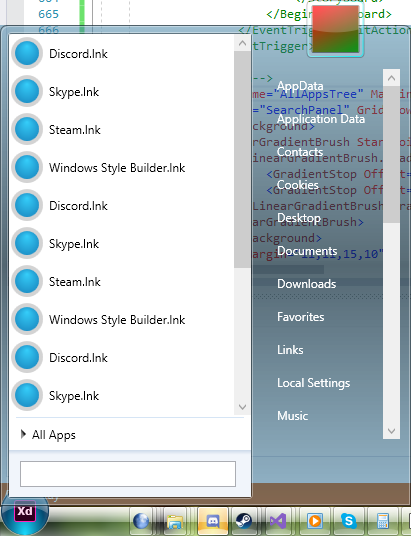 That having been said, getting this working reliably could be tricky, as the XML files vary somewhat between Apps. I'm still optimistic about it, though. CALL RIGHT NOW AND YOU'LL RECEIVE THIS TILE SIDEBAR ABSOLUTELY FREE!!!1!!1!!111!!!! Nice. That's cool that you found a way to make live-tiles. I didn't know that Ivo included undocumented features into classicshell. XML files might make it easier on you. No downloads yet, it'll be out...when it's ready. Add "Start9" to every picture name that's uploaded. Then the search bots will index them, and bump them up higher with each view? where to download Start9 ? Its currently not out, and in a beta/invite-only stage. Sorry. Out of curiosity: Is this a completely new program or is it based on Classic Shell code? It's new, although I'd hardly be surprised if we ended up learning a fair bit from Classic Shell's source code. 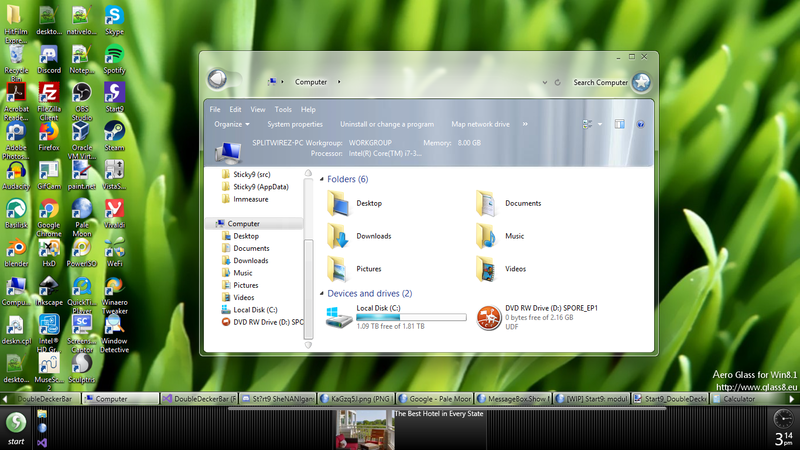 This Taskbar was built using Start9, and has no ties to Explorer. it's a WIP, obviously, but nonetheless, it's progress. is Start9 tested on Windows 7 ? Start9 had a website too! Can I be one Insider? That post is old, the server's pubic. The invite link is on our website, which can be found in the OP. Yes, this is (the beginning of) what you think it is. 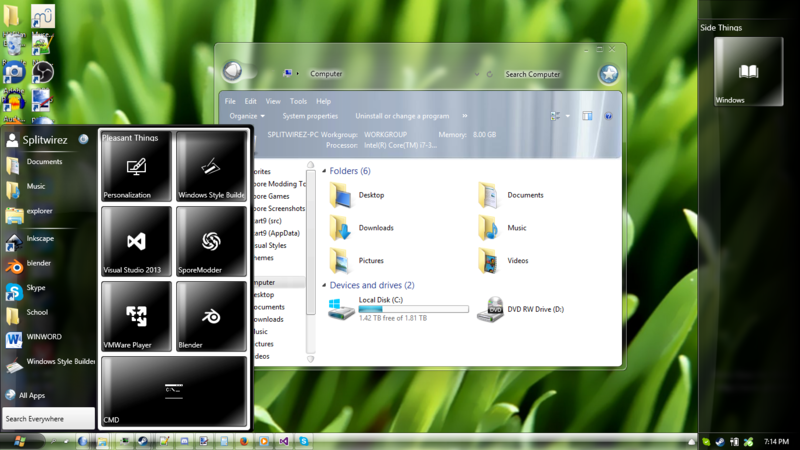 Does your Start9 also modify Windows themes? ...and I also suppose the Taskbar. It's a modular shell. It doesn't modify Themes though. Well, then I'll have to "be content" to only change start menu. Unfortunately I don't think I'll be able to play with your creation for a while, but I'll keep an eye on its development. I don't remember if I've already asked you before, does it "only" changes the style of the start menu, or it's possible to modify the shape/position of the elements? Depends on your selection of Modules. Just another question: given it's in an early state, how is it supposed to create or modify a skin? With other software you can use Notepad, Notepad++ and so on (ok, for Rainmeter at least! With Start9, is there's a way to edit or create a new skin? Last edited by fonpaolo on Tue Apr 17, 2018 1:35 am, edited 1 time in total. Last edited by fonpaolo on Tue Apr 17, 2018 2:32 am, edited 1 time in total. As for exactly how skinning will take place in start9's current iteration, I'm sure splitwirez can elaborate. Thanks Jcee, now I have enough information. I'm asking, just because my intention is to eventually create the start menu I'm thinking of building, but, hoping Ivo could forgive me, I'm not comfortable with Resource Hacker and the way to build skins for Classic Shell.